Bad news frightens us — but good news terrifies us. The May jobs report came out Friday. It revealed the unemployment rate has sunk to a booming 3.8%. For only the second occasion since 1969… the unemployment rate has slipped below 4%. 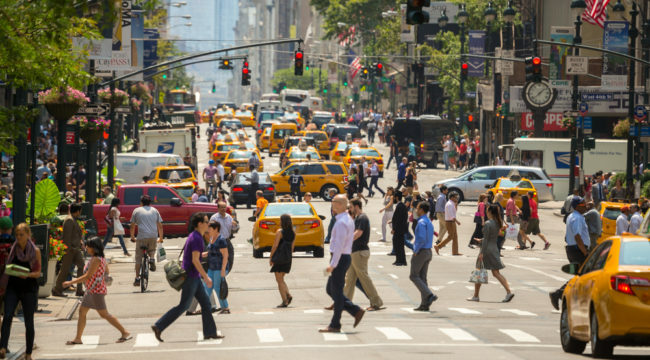 “New milestones in jobs report signal a bustling economy,” assures The New York Times. Meantime, Goldman Sachs believes the unemployment rate could plumb 3.5% by next year. Markets reacted in grand style today — the Dow Jones was up over 200 points this morning. The last time unemployment dropped below 4% was April 2000 — the peak of the dot-com derangement. The economy was in recession by March 2001… less than one year later. But that is one isolated instance, comes your reply. You say we pick a cherry to confirm our thesis. Prior to April 2000, unemployment last slipped below 4% in December 1969. The economy dropped into recession that same month… where it remained until November 1970. The recession of 1969–70 ended what was then the longest economic expansion in U.S. history. At 108 months and counting, we now wallow in the second-longest economic expansion in U.S. history. Does today’s 3.8% unemployment rate mean the show is drawing to an end? We still have only cited two examples of circumstantial evidence, you counter — the jury is not convinced. Ms. Smith is chief economist at Georgetown University’s Center on Education and the Workforce. What we find is that the low unemployment rate is often associated with a boom phase just before a recession. It’s almost a precursor for a recession or a precursor for another slumping economy. That is a chart giving the history since 1950. On each occasion the unemployment rate fell below 4%, it reveals, recession soon followed. 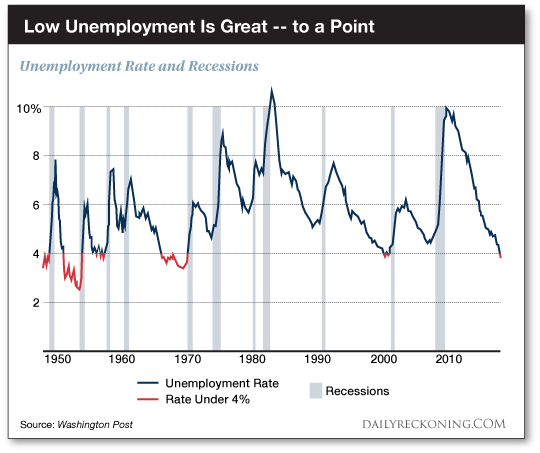 Now, it is true… we have been treated to recessions when unemployment has remained above 4%. On each occasion that the unemployment rate sank beneath 4%… recession was soon on tap. To remind, it now rests at 3.8%. But why should recession rapidly follow peak employment? Extremely low unemployment is often associated with an “overheating” economy. This overly excited economic engine, our monetary authorities have historically concluded, requires a good cooling off. They must therefore increase interest rates to bring the business under control. But they often end up throwing the engine into reverse. The early 1950s… the late 1950s… 1969… and 2000. 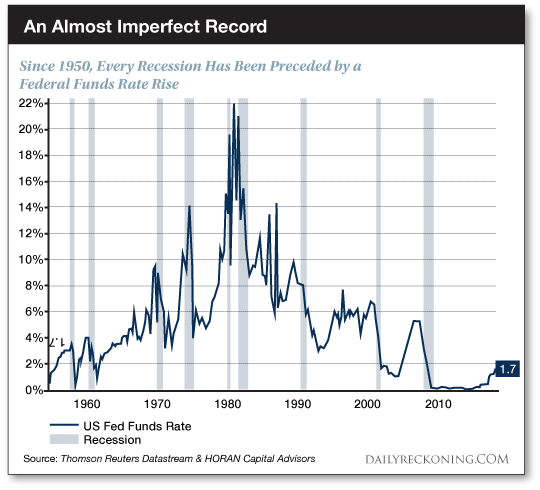 And note the gray bars of recession forming shortly thereafter. The Federal Reserve has been increasing interest rates since December 2015. It will likely increase rates once again in shortly over one week — the market odds presently stand at 91%. GDP has only grown at an average 2.16% annual rate for the past eight years. At the going rate, 2018 growth will remain below 3%. Is this the indicator of an overheating economy? Official unemployment statistics are highly misleading. They do not count approximately 10 million able-bodied working-age adults who have simply given up on work. Adjusted for those “missing workers,” the real unemployment rate is about 10%, a depression-level figure. Jim believes the Fed will have to drop its rate hikes once it realizes the economic patient can’t take the bitter medicine. But will it be in time to ward off recession? And given today’s ironically disconcerting unemployment number… is recession far behind? “It is always dawnest before the dark,” says our co-founder Bill Bonner. We offer no specific forecast.